The Chad Valley Driftstone Carpark (Size H40, W66, D30.5cm) is an absolute blast! 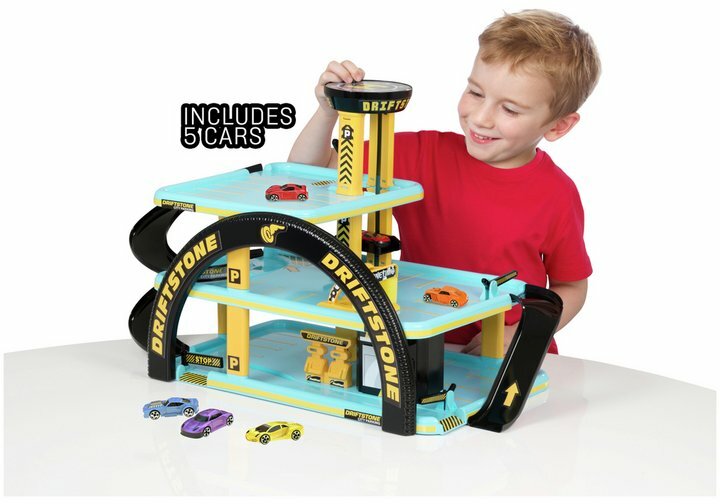 This three (3) level garage playset stimulates creative thinking and imaginative vehicle play. The levels of the Chad Valley Driftstone Carpark are joined via interconnected ramps, plus this set is jump-packed with features such as a functioning car lift, car wash, store, fuel pumps, barriers, heli-pad, parking areas as well as five (5) die-cast cars for your little one to zoom about with for long-time racing fun. An additional bonus is that the track pieces are compatible with other Chad Valley track sets, so you can mix and match to great a whole new unique experience for your little one. Get money off with April 2019 free Argos voucher codes, see if there's a discount code for the Chad Valley Driftstone Carpark with Cars product. 4.0/5 from 4 recent reviews.